I of course laughed. And then suddenly remembered a rather odd event of my life. For starters I am usually never jealous of anyone no matter what their achievement or attributes are. Yet there is someone I have always been jealous of. I have no idea why because as far as I see I managed to do better than her in all aspects. But still something about this person has always evoked a weird sense of competition in me. Moving on. So the story is that this person was an avid reader. And so was I. But the difference was she was much much faster reader as compared to me. And one day out of the blue I took on the self imposed challenge of becoming a quicker reader than her. Yes I managed to achieve that. But do you also know that this is the only thing about me which I also hate now? Books don’t seem to last on me. I read them at breakneck speed and they get over as quickly as I started. It has now become a curse. So the moral of the story is that anything born out of negativity or a destructive sense of achievement can never evolve into a happy end. Because the grass is greener on the other side provided it continues to be the other’s side. You tell me how fast can you read? And what do you think, is being a fast reader a boon or a bane? I am taking part in the Write Tribe Festival of Words 8th-14th December 2013 and this post has been written for Day 3 which has the prompt as books. Depends upon the book…. if it’s really gripping then can finish it off very fast or else I would take my whole life. Most of the time I read faster than most other people do, and I have realized that it is because I use a skimming technique where I tend to register the key words in each sentence rather than look at the grammar, punctuation. However, this does result in situations where I have to re-read sentences to allow them to sink into me a little more thus reducing my overall speed. Yes that happens with me too. Often I have to read pages again to understand better as well. A lot of rushdie’s make me do that.. Thanks Shilpa 🙂 yes genres, authors and sometimes also situation do affect speed of reading… agreed. It really depends on the book… Like the one I started today morning. I’m almost 80% complete and its fabulous and gripping and scary!! I can now never really return books. Even if I borrow then I have to pick them up for myself as well..
hehe or not finish it and dump it, I have done that too! hehe and why may I ask lady? The grass is greener on the other side because it maybe fertilized with crap. Love the moral of your story – that’s food for thought. I also speed read. But some books need to be read at a slower pace. Richa , I only read mystery and thrillers at a fast pace as I am eager to know whodunnit but the other stuff though I read fast I take time to read , understand and notice the smilies, metaphors , punctuations ,marks , grammar etc. I think its all about getting through the first few pages for me, if I can do that then its super fast. I usually savor every line in a book. So I usually don’t speed my way through any book. 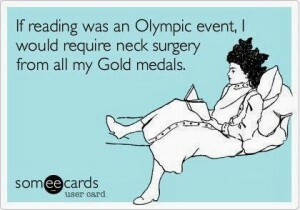 But if it is a gripping read, I do that.